For a program list of the items included and all their accompanying links in this one hour show, you can find the information on my website in the Stuph File Program section, or just follow this link to #0119. Stuph File Program listeners, there is another video slide show awaiting you! 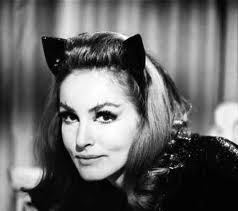 This one hails from August’s #0105 and features TV’s original Catwoman, Julie Newmar. This is the second time I’ve had the chance to talk with this amazing woman. She was a guest on my old radio show many years ago. Many thanks once again to PR maven Harlan Boll for not only getting Julie to me, but supplying me with most of the pictures that make up the video presentation. Watch the slide show on YouTube while the audio plays! Share the link with fans of the original purrrr-fect Catwoman! For a program list of the items included and all their accompanying links in this one hour show, you can find the information on my website in the Stuph File Program section, or just follow this link to #0118. To the loyal listeners of The Stuph File Program, I thank you for following the progress of the show. I try my best, each and every week to bring you both interesting guests and quirky news stories in what is hopefully an entertaining hour-long format. Some of those guests include celebrity interviews, and lately, thanks to some great L.A. based PR people that I have dealt with over the years (Harlan Boll and Steve Rohr are at the front of the class) I have had some really good ones. In the past two weeks The Stuph File has featured a multiple Emmy Award winning actress and an Academy Award winning actor. Actress Michael Learned, who won three Emmys for her role as the matriarch on The Waltons (and one for her follow-up show Nurse) was show #0117. The week before on #0116 it was Academy Award winning actor George Chakiris, best known for playing Bernardo in West Side Story. As much as I would like to think that every listener to the show hinges on my ever word each and every week, I know that can’t always be the situation. So what I’ve decided to do, when time permits (because the process is extremely labour-intensive, time-wise) I will turn some of the celebrity interviews into a YouTube audio slide show, so that you can get to just those interviews on my YouTube page. I hope you will enjoy them and share the links with other like-minded family and friends who may be interested in the celebrities that occasionally appear on The Stuph File. Just below are the first two in question. First up is Michael Learned. For the better part of a decade she was Olivia Walton on the hit CBS series that took place during the depression on Walton’s Mountain. Having had the chance to talk to her was an absolute joy and delight. She took the time to talk to me, even though lately her schedule has been chocked full with work. She has recently stepped in for Jeanne Cooper on The Young & The Restless while Jeanne recuperates from an illness. The second interview is with George Chakiris. It’s hard to believe that it’s been 50 years since the iconic Hollywood musical was made. George has not only kept busy as an actor, but he has spread his creative wings to create a collection of jewellery that he makes himself (which is a huge hit in Japan). We talked about his acting and his creative artistry. If time permits, I will attempt to make other such celebrity interviews available. You can also venture through the front door of my YouTube page to check out other, more visual television ventures that I have been part of over the years. For a program list of the items included and all their accompanying links in this one hour show, you can find the information on my website in the Stuph File Program section, or just follow this link to #0117. For a program list of the items included and all their accompanying links in this one hour show, you can find the information on my website in the Stuph File Program section, or just follow this link to #0116. Lucinda Ruh, world class figure skater & author, Frozen Teardrop: The Tragedy and Triumph of Figure Skating's "Queen of Spin"